Do you incorporate AAI in your professional practice? Clients can benefit from the inclusion of an animal into a goal-oriented and structured therapeutic intervention when performed to high standards. We suggest Standards of Practice in AAI and the AAI competencies based on the research of Dr. Leslie Stewart as core standards documents. Additionally, many practitioners choose to register with Pet Partners as a way of honing their skills, and our two-year renewal cycle is an important opportunity for an independent third party to evaluate your animal’s level of interest in these types of interactions. Historically it has been a challenge for professionals to find liability insurance for paid-for services that are inclusive of animal-assisted interventions. Pet Partners is pleased to announce that we are piloting a practitioner insurance program. Learn more about obtaining insurance as a professional here. 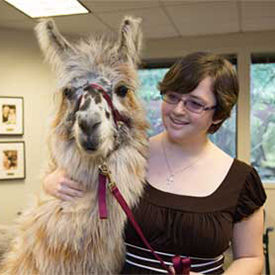 Don’t have your own therapy animal? Partner with a volunteer team! Although some professionals choose to use their own animal in AAT, partnering with a highly qualified volunteer is not only a valid choice, but in some cases better. As a professional, your focus is on your client. Will handling an animal be a distraction? If you plan to use AAT for only certain parts of your day, where will your animal wait? How will you manage their need for breaks and stimulation? And keep in mind that not every animal is well-suited for therapy work. If your animal does not enjoy interacting with clients, does this mean you won’t offer AAT? Instead, consider a team who you schedule ahead of time for specific visits. Imagine being able to identify the most appropriate animal based on your client’s needs and preferences. You would have someone who can attend to the animal’s needs as they arise, and who has been trained and their animal vetted for safe interactions with strangers. This person and their animal can be an amazing resource for you and your client. Why work with Pet Partners Teams? $2M comprehensive general liability insurance for all volunteers. Required handler education including topics such as confidentiality, infection control, effective communication, and animal handling best practices. Team re-evaluation every two years ensures the suitability of the animal as they mature. All animals meet our non-aggression standards, including the exclusion of protection dogs. Stringent infection control protocols, including thorough grooming standards, required hand hygiene before and after any interaction, and exclusion of raw meat diets. Nine different species are registered through Pet Partners, expanding your possible pool of therapy teams to include not only dogs but also cats, mini horses, rabbits and guinea pigs, birds, rats, and even mini pigs and llamas! How Can I Find a Volunteer? Pet Partners aggregates volunteer opportunities for all our handlers. You are invited to post a volunteer opportunity and interested therapy animal teams will contact you.